On my quest for skin-perfection I'm always reading up on skin care. Origins is a brand I've heard of solely through blogs and all of their products are packed full of skin-loving ingredients. I'm becoming more and more conscious of what I'm putting onto my skin as I'm becoming more knowledgeable of skin care and associated ingredients. Anyway, I ordered this little gem after reading so many great reviews. 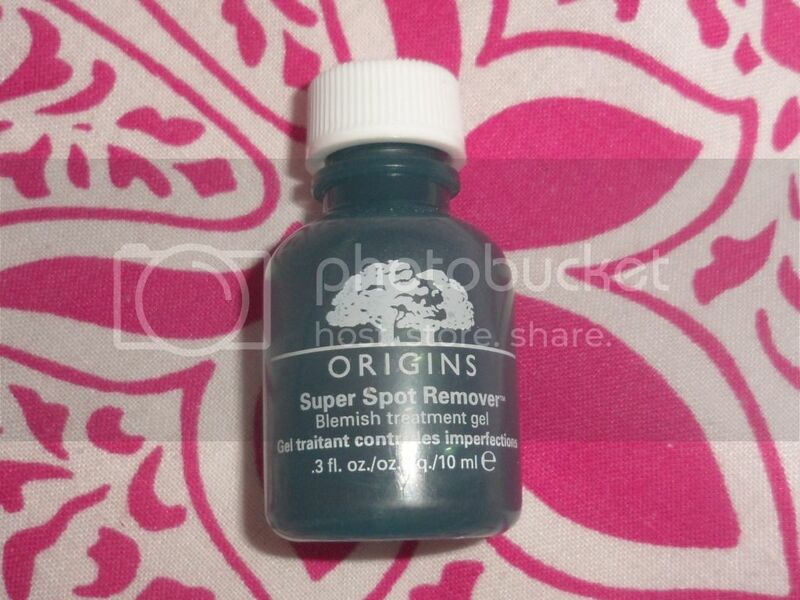 The Origins Super Spot Remover is a gel which contains a potent mix of salicylic acid, red algae, caffeine and exfoliators to help reduce, fade and fight spots and blemishes. I've used these kinds of treatments for as long as I can remember, from Oxy10 to PanOxyl with varying degrees of success. I've been using this after I've thoroughly exfoliated and cleansed my skin, at night, to gain the best results. I dab the smallest blob of the gel onto any spots and leave it to work its magic. I warn you, this stuff STINGS, but to me this means it's working. The gel sort of sets and provides a layer over the blemish which then dries it out, (this all sounds very gross) reducing the size and redness of the blemish overnight. I do suggest using a moisturiser if you're using this on large portions of your face, as it does dry out my skin and leaves it feeling tight especially across the cheeks. The bottle is minuscule! I was actually surprised at its size, but a little product does goes a long way. However, £13 for just 10ml is a little steep in my opinion when products like PanOxyl are less than £5 for a tube full and basically do the same job (just less effectively). I am slightly on the fence with this product, I really love the results and the 'quick fix' it provides, but the price and amount of product really puts me off repurchasing it. Have you tried the Super Spot Remover? What did you think, is it worth the price tag? Hey nice blog here, I like your make up posts! Wanna follow each other? Visit my blog and let me know....hope you will like my posts!